Amazon Kindle D01100 Wi-Fi 2GB Reader Tablet Works. Condition is Used. Has 2 tiny dark specs on screen in photo, Shipped with USPS Priority Mail. Amazon Kindle D01100 with free case. Condition is USED, from a non smoking home. Amazon 6" Kindle (4th Generation) 2GB Wi-Fi - Graphite Model D01100. Condition is Used. Shipped with USPS Parcel Select Ground. You are buying a preowned condition Amazon 6" Kindle 4th Generation D01100. The units will still show signs of normal to light wear. The actual units will either be gray or black. Cases are in used condition and show signs of stickers and wear. 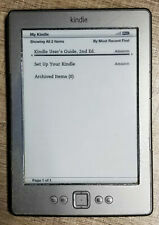 New ListingKindle Model D01100 Graphite (4th Generation) Ver: 4.1.3 - Excellent Condition! This Kindle is in "Excellent" Physical Condition and Perfect Working Condition. The pictures speak for themselves regarding the condition of this Kindle. Note 1 : I did not reset this Kindle to the Factory Defaults. Amazon Kindle Model # D01100 Grey WiFi (excellent condition). Never used Condition like new. Used. Fully functional. Includes 30 day warranty. The item may have some signs of cosmetic wear, but is fully operational and functions as intended. See pictures for reference. Comes with generic charger. 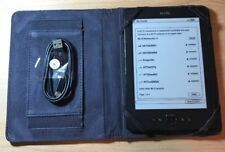 Amazon Kindle 4th Generation | Model D01100 | 2GB | Wi-Fi | Condition is Used. This is the fourth generation model D01100. Amazon Kindle 4th, 2GB, WiFi, 6in, Gray, eReader. These Kindles are fully functional and in excellent working condition. There is minimal wear on the body from normal use, as shown in pictures. Noticeable wear on case only. It does not affect the functional integrity of the Kindle whatsoever. Screen in poor/fair condition- a few dead pixels and/or scratches on it. Amazon Kindle 4th Generation | D01100 | Wi-Fi only | TESTED. Condition is Used. Shipped with USPS Priority Mail. Amazon 6" Kindle (4th Generation) Graphite - 2GB, Silver, Wi-Fi (D01100E) . Condition is Used. Shipped with USPS Priority Mail. Amazon Kindle 4th/5th Generation, 2GB, WiFi, 6in, D01100, Black, include M and Carey in case & eReader. Condition is Used. Shipped with USPS First Class Package. Used. Fully functional. The item may have some signs of cosmetic wear, but is fully operational and functions as intended. The tablet has dead pixels. See pictures for reference. Charger not included. Up for sale, we have a 4th generation Amazon kindle. - Output: 5V. - Gray color. - Model No. - Model No: A1265. MODEL: D01100. AMAZON KINDLE. 6" E INK DISPLAY - 2GB - Wi-Fi. KINDLE IS IN GOOD CONDITION. THERE ARE NO SCRATCHES OR SCUFF MARKS ON THE SCREEN. ALL BUTTONS WORK. Condition is New. The condition is perfect seeing as how the item has been in a box for 5 years. Not refurbished! An easy way to take your books and more with you on the go! This Kindle is used with a few scratches to the casing but no major cosmetic damage. The screen is free from cracks but when tilted to the light you can see a few hairline scratches. It has been tested and is in working condition - it is ready to go! 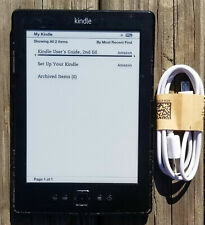 Listing is for the Kindle, purple case as well as non-OEM USB charging cable only. Amazon Kindle 5th Generation eReader 2GB WiFi 6in Black. Amazon Kindle 4th Gen Non Touch 2011 eBook Reader 2GB WIFI 6" Graphite D01100 . Great preowned condition I manually updated this kindle so it has the newest update. Shipped with USPS Priority Mail. Amazon Kindle eReader (4th/5th Generation) 2GB, WiFi, 6in, D01100. This Kindle is blacklisted. Screen in good condition- one or two dead pixels. Model: D01100. Product: Kindle 4th Generation. Storage Size: 2GB. It has been tested and works perfectly. The software has been updated to the latest version (4.1.3) and it has been factory reset and is ready for you to begin using it. May have light wear from normal use. Amazon Kindle 5th - 2GB, WiFi, 6in, Grey. Amazon Kindle D01100, 2GB, Wi-Fi, 6" - Black. This is a USED item but it has been tested and cleared. There may also be sticker residue on the back. D01100 2GB WIFI 6" screen, Kindle color: Graphite. Amazon Kindle 4th Gen (No Touch) 2011 eBook Reader. Item pictured is the exact item you will receive. Item is used but has no major flaws. Get it while you can! Because of my competitive pricing and super quick free shipping I tend to sell items fast! Feel free to PM me with any questions you may have. I usually ship the same day payment has been received. Check out my store for other great items! Amazon Kindle d01100 Specs Display — 6" diagonal display, 600 x 800 pixel resolution, 16-level gray scale. This is a used Kindle in very good condition. Very minor wear. Uses Wi-Fi. Amazon Kindle 4th Generation | D01100 | Wi-Fi | TESTED. Condition is Used. Shipped with USPS Priority Mail. FULLY TESTED AND WORKING. LOOK AT PICTURES FOR MORE. Kindle D01100 4th generation in good condition. Works well and battery holds a charge.